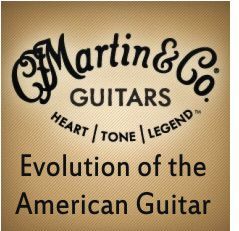 NAZARETH, Pa., July 13, 2012 /PRNewswire/ -- C. F. Martin & Co. is inviting musicians to take a trip back in time with the introduction today of a groundbreaking guitar technology available in the new four-piece Retro Series: D-18E Retro, D-45E Retro, HD-28E Retro, and OM-28E Retro. Paying homage stylistically and sonically to the iconic classic Martin guitars of the 1930's and 40's, this new series features traditional non-cutaway Martin guitars incorporating significant advancements in plugged-in sound reproduction. The series exquisitely captures a sought-after sound, melding traditional models with state-of-the-art technology, and will appeal to musicians and guitar aficionados alike.